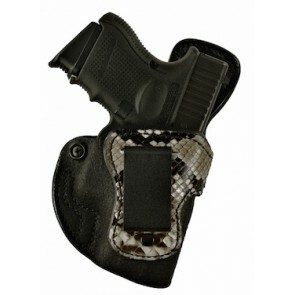 High Noon Holsters presents the Python Skin Collection. Pythons have beautiful, extremely durable skins that lend themselves to diverse applications such as accenting our holsters! We always purchase the best quality in our hides and here is why: Because our python hides are purchased from farms, our hides are free of flaws. Pythons that live in the wild are exposed to a number of potential sources of harm. From prey animals to natural events such as a tree limbs or falling rocks, wild python hides can end up with imperfections. Python farmers protect python from being harmed by eliminating the potential for contact with predators and other forms of accidental damage. Though not available for sale right now, we can make our Public Secret, Hideaway, Upper Limit and Bare Necessity in Python as well. Please call us for pricing - 727-939-2701.